New York City Fountain House Gallery presented this “Danse Macabre” from New York City artist Angela Rogers. 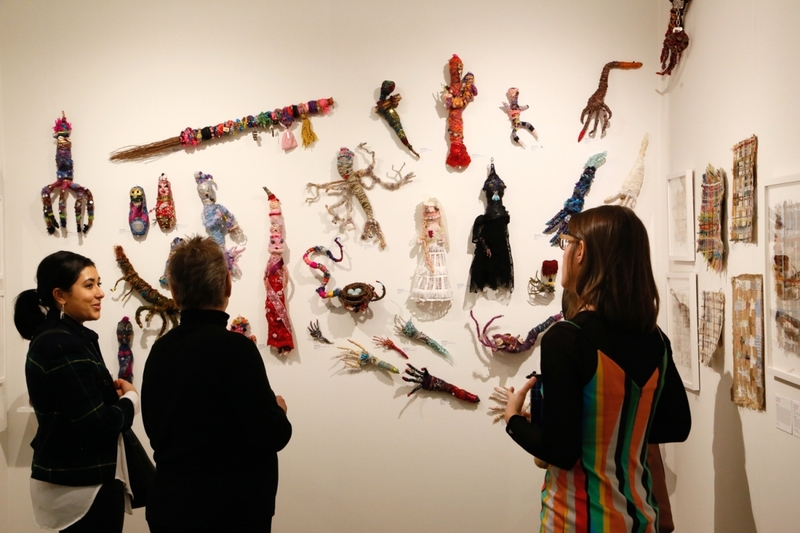 The artist calls them “Poppits,” and the wire, yarn and fabric forms range from witches and brides to monsters and widows. 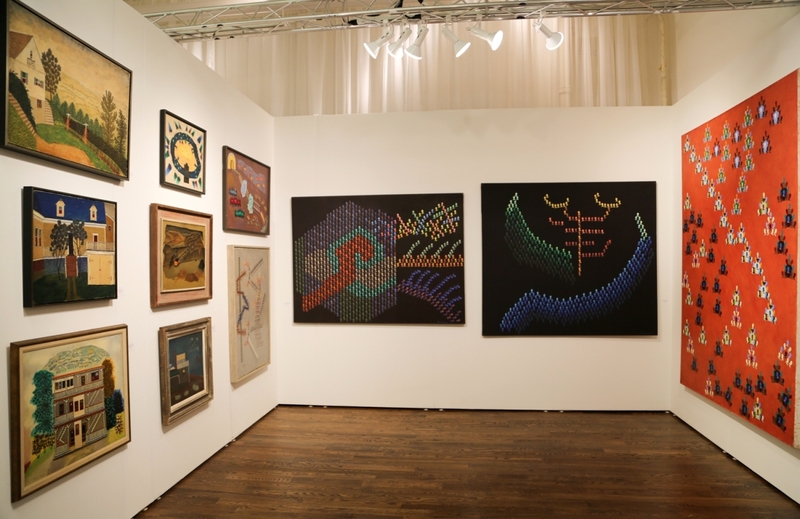 NEW YORK CITY – The Outsider Art Fair made its swaggered footprint at the Metropolitan Pavilion January 17-20. 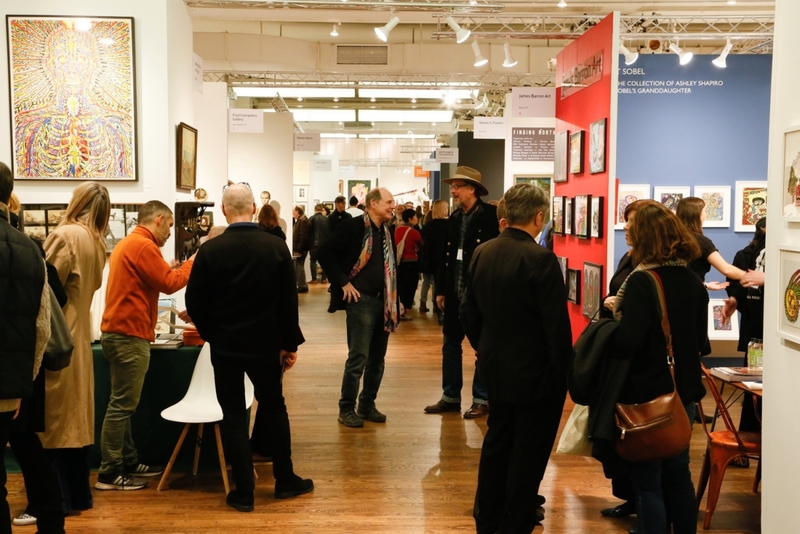 More than 60 exhibitors brought their exhibitions with them to the trendsetting event in the New York calendar, and collectors, curators and spectators – numbering close to 12,000 – filled into the aisles to devour the show. The fair is akin to a good book, each booth a chapter that dives into the infinite expanse of the imagination. It is a magnet for artworks that elicit perspective and feeling, whether those emotions are despair and pity or hope and inspiration. 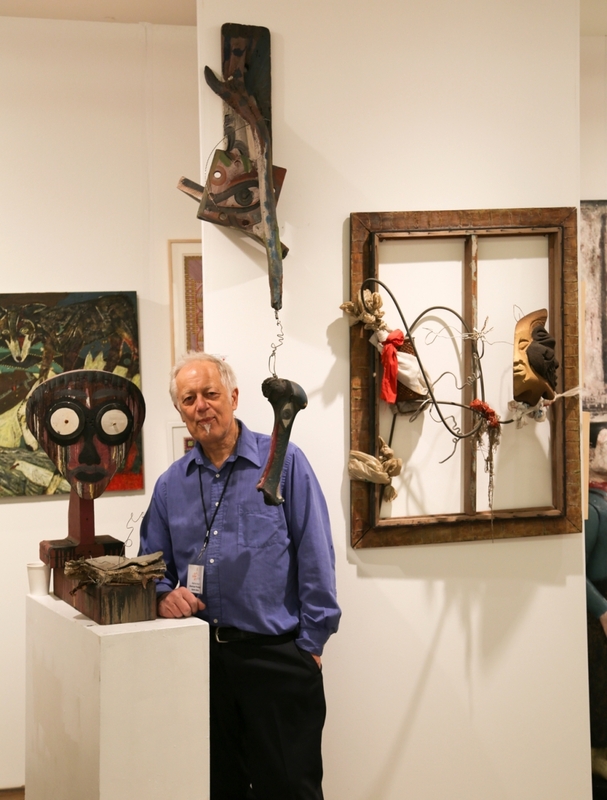 For inside many of the artists on the show floor is a truly compelling story. The realities expressed – both real and imagined -throughout the genre are some of the most primal, graphic and genuine in the art world, and that is what makes the material so accessible. 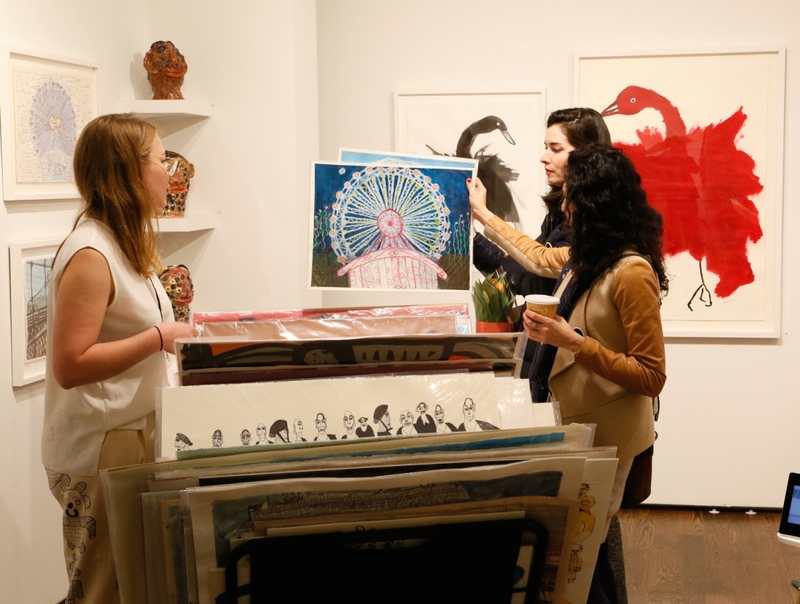 While the field has established a range of blue-chip artists who are constantly setting new sales records, emerging artists and new discoveries are just as commonplace on the show floor. “The field is still evolving,” said fair director Becca Hoffman. “Broader conversations, new artists are being discovered all the time; new players are entering the field; and there is increased attention and visibility for the field in the context of modern and contemporary art institutions and international biennials. 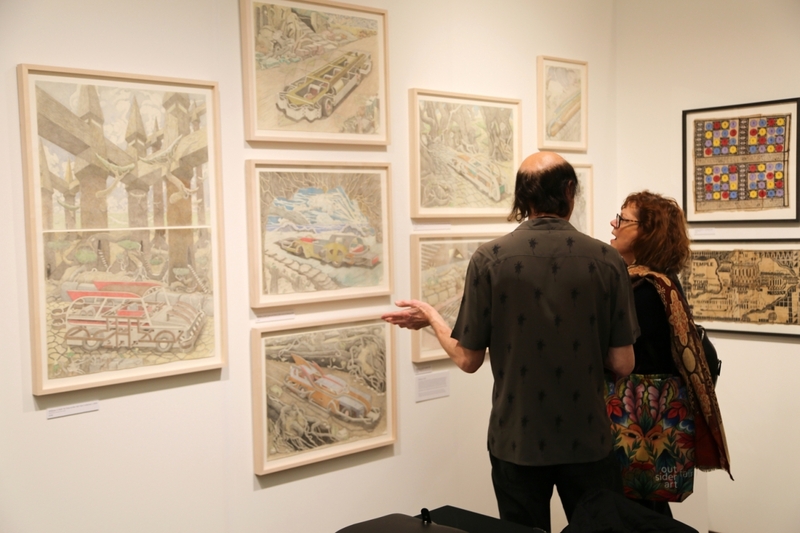 As the Outsider Art Fair is the sole global art fair dedicated to self-taught and outsider work, it is an excellent meeting point to further the field through conversation and exchange of ideas and art. 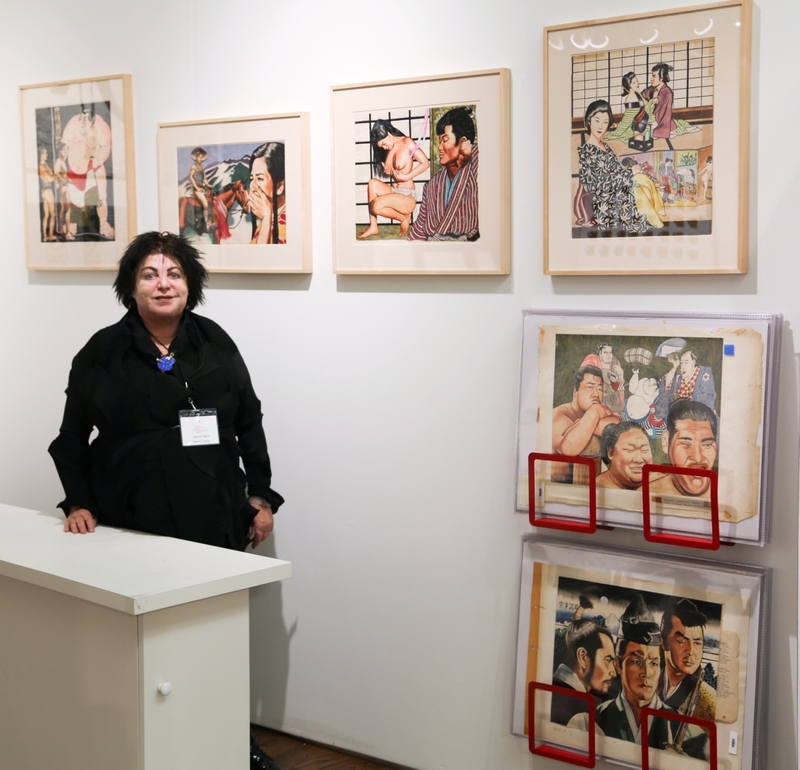 A tribute exhibition to Phyllis Kind, one the fair’s original dealers and a major proponent of the outsider art field since its inception, was organized by Raw Vision senior editor Edward Gómez. Kind passed away in 2018. 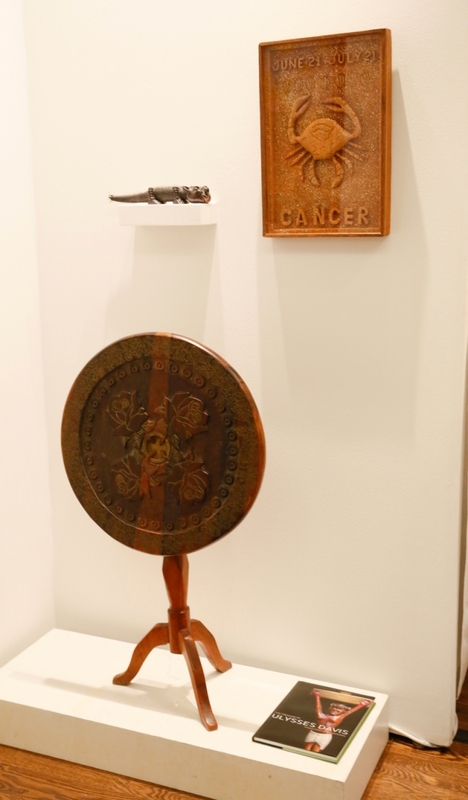 “The exhibition brings together artists she represented, those she collected, and artists who influenced her way of thinking,” Gómez told Antiques and The Arts Weekly. 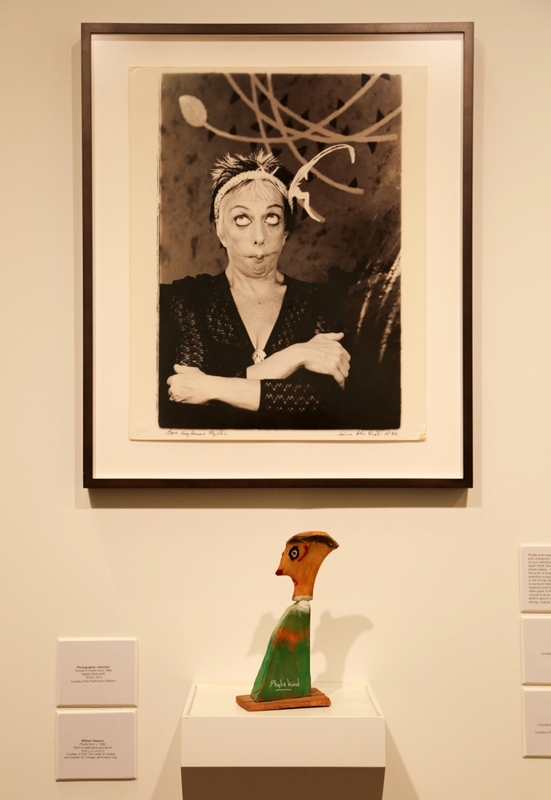 “She was the first major art dealer who showed self-taught artists alongside trained artists, which was daring in the 70s and 80s.” The booth featured portraits of Kind alongside works from artists Carlo Zinelli, Adolf Wölfli and Martin Ramirez. Kind played a primary role in exhibiting and building the market for these now-widely featured artists. Attendees filled the aisles not long after the opening. 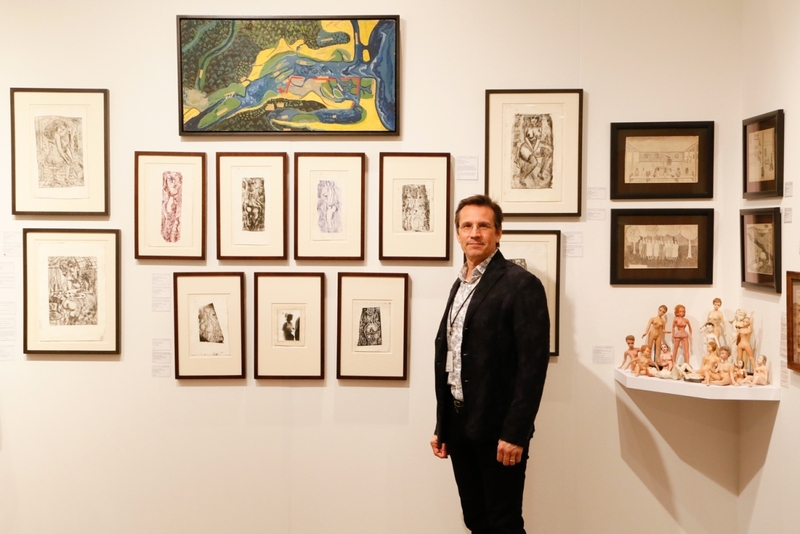 New Haven dealer Fred Giampietro brought an Americana-meets-outsider sensibility to his booth, drawing a parallel to how the sales at Christie’s and Sotheby’s presented material that week. Giampietro presented the work of contemporary artists Jana Paleckova, of whom he sold 20 works; Peter Wickenden; and Larry Lewis. Giampietro’s long career in Americana is exemplified in the strength of the objects he brings from the field. 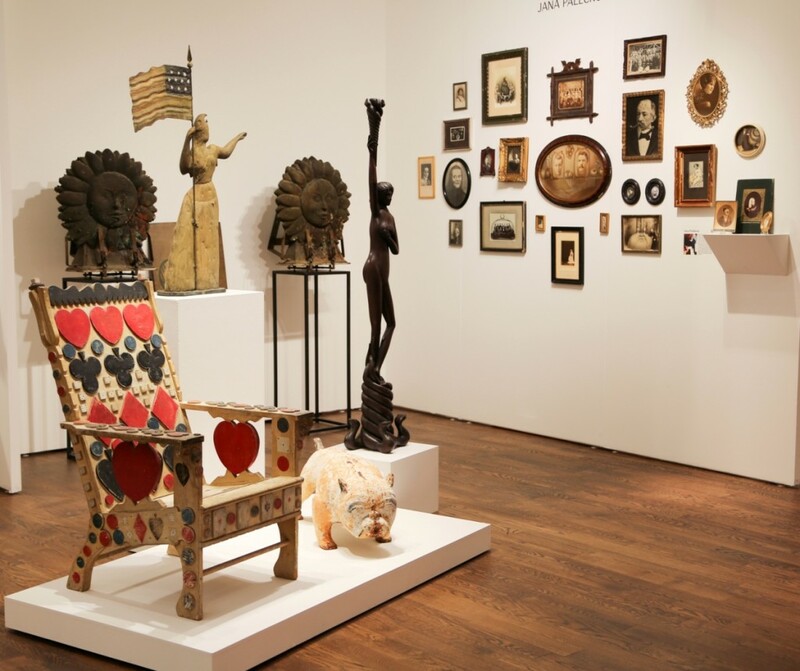 They were powerful, sculptural works and there was not a dud among them – he sold 80 percent of his Americana stock. An early Cushing and White Liberty weathervane with original paint was the centerpiece of his display, and it sold to a collector. Behind it was a pair of sculptural industrial copper sun mask molds, circa the first half of the Twentieth Century. A slim carved wood figure of a woman holding a torch as she stood on the coil of four intertwined serpents, about 50 inches high, was unmissable. Giampietro believed it may have been a floor lamp in an earlier life. “We were pleased that the anonymous work that we showed did very well,” he said. 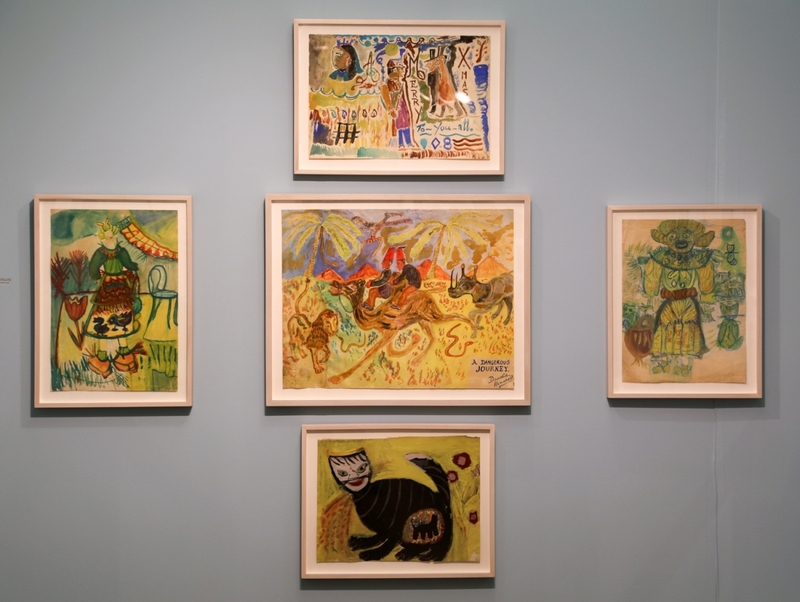 Chicago-based Carl Hammer Gallery brought works from artists Joseph Yoakum, Mr Imagination, Henry Darger, Howard Finster, Frank Jones and Eugene von Bruenchenhein. Hammer noted moderate activity selling from his Finster collection and works from Jacques De DuGlass. Two canes from Stick Dog Bob were among the only objects in the booth. 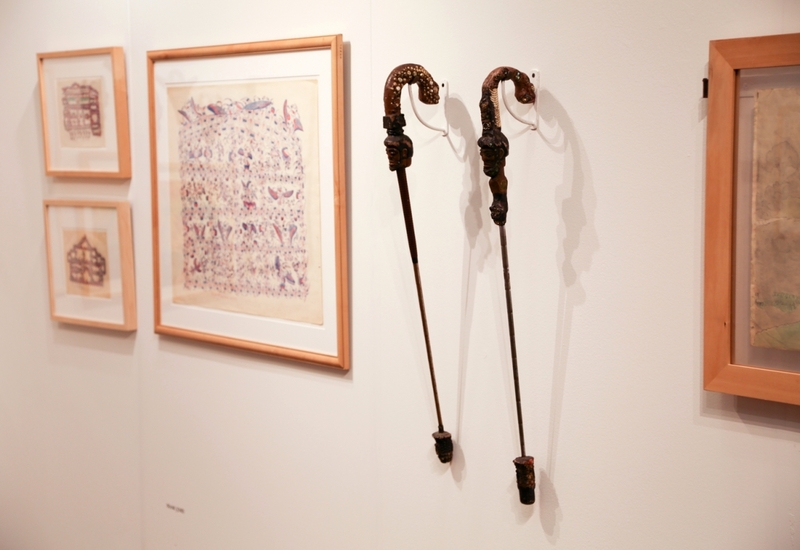 Hammer discovered the artist’s work in a Chicago-area resale shop in the 1970s to 1980s. He found the work of Mr Imagination in the same place at around the same time. “Both sources came from this shop. 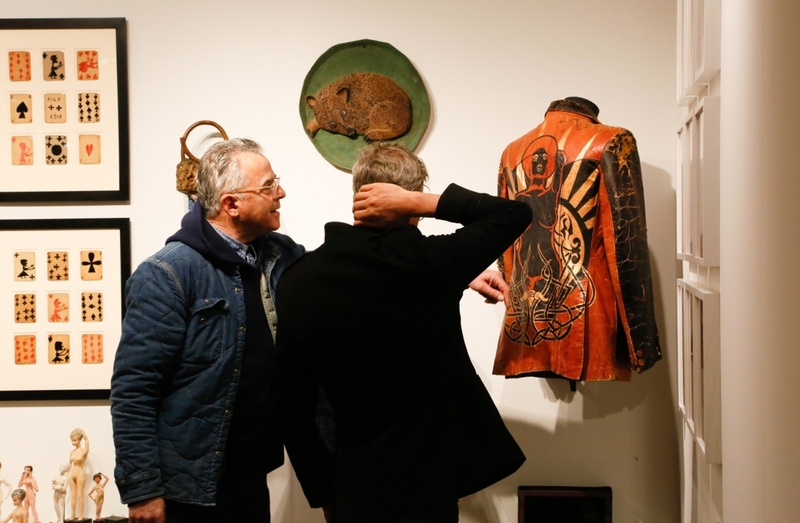 The owners had a pretty cool eye for stuff like that, and I was able to turn up a few other good pieces because of their eye and their location,” he said. On the Stick Dog Bob canes, Hammer observed that there exists a range in decoration, some more reserved and others elaborately decorated from top to bottom. 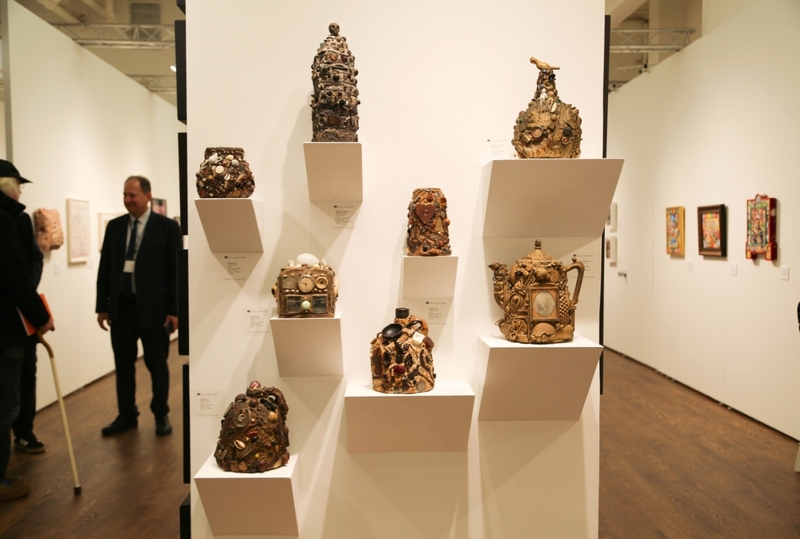 The examples in Hammer’s booth featured facial carvings and were imbued with brass tacks, stones and glass pieces. The owners of the resale shop would not say, or did not know, Stick Dog Bob’s real name. The entire body of known work numbers around 20. Stick Dog Bob reportedly worked at a mechanics shop and created the canes for his entourage of friends. Hammer related that he had a decent, but not outstanding, show. 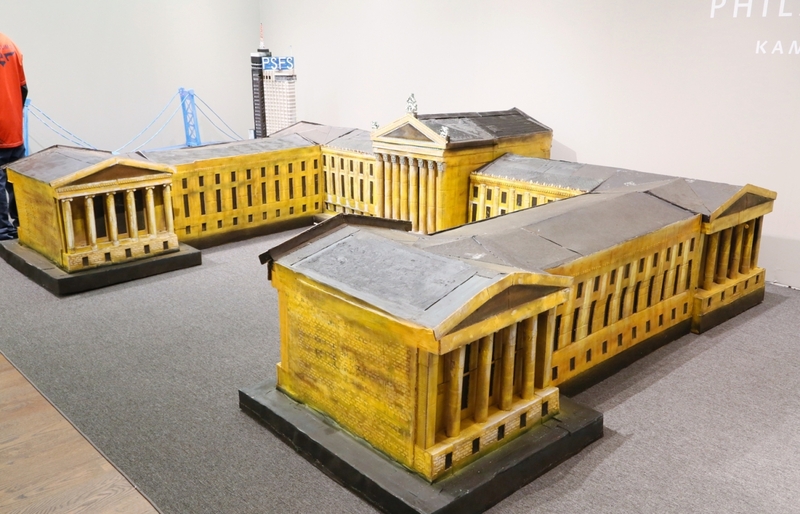 Much in the same way that Christie’s and Sotheby’s came to dominate quantity offered and singularly own most commercial activity for Americana in Americana Week, Hammer raised concern that the two house’s burgeoning activity in outsider art may not be beneficial to the Outsider Art Fair. Fred Giampietro, New Haven, Conn., featured a mix of known and unknown artists. Sales from this view included the Gambler’s chair and the Cushing and White Liberty weathervane. Giampietro also sold 20 works from artist Jana Paleckova, whose work is on the right wall. 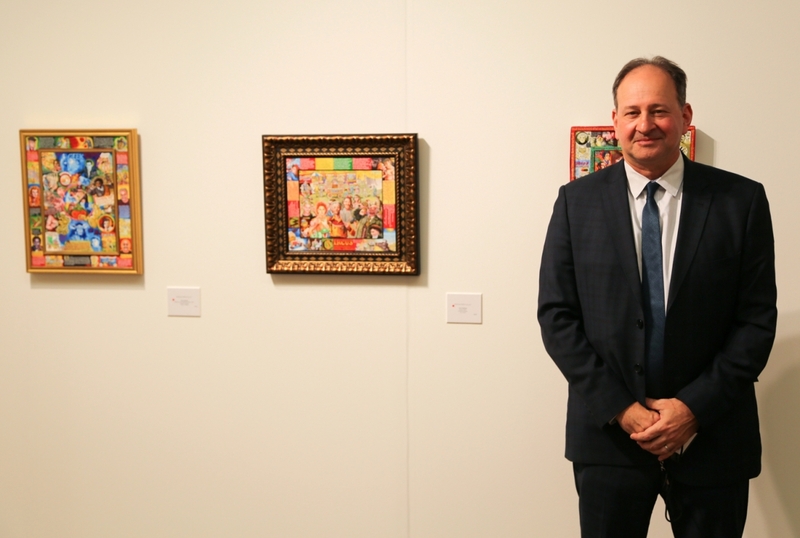 Marion Harris exhibited the works of Daniel Rohrig, an artist she debuted in Rago’s 2018 Curiouser and Curiouser sale. 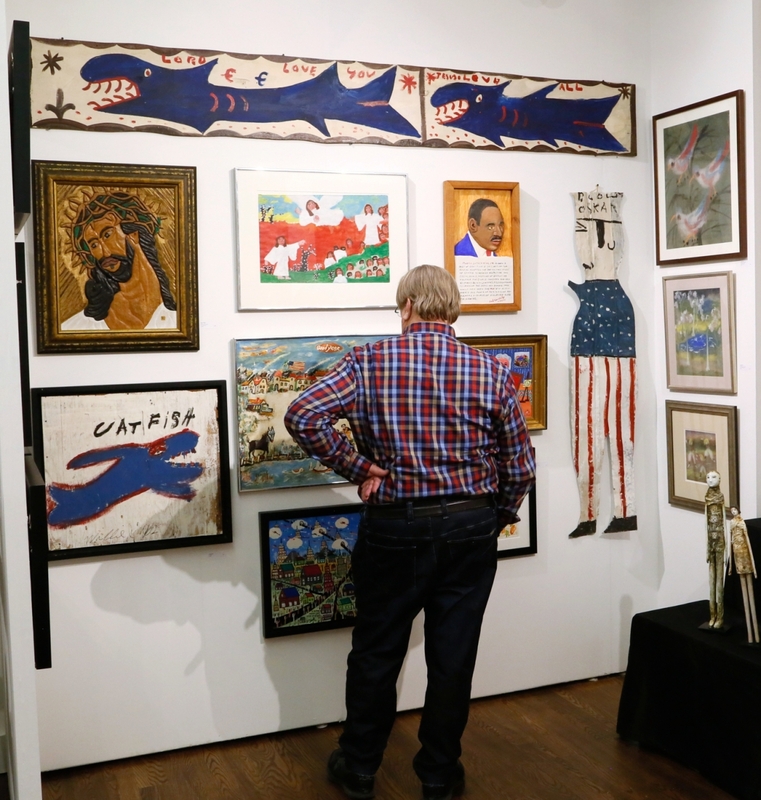 The American Folk Art Museum bought two works out of that sale and followed up with acquiring five additional works from Harris at the fair. Harris sold seven others to collectors during the run. Rohrig was a Twentieth Century self-taught artist who served in the Pacific in World War II. He became captivated by Japanese film and the style of the industry’s movie posters, appropriating both that style and Japan’s famous film stars into his own works. Running off the success of her work in last year’s fair, Harris again exhibited Jordan MacLachlan’s ceramic “Subway” series figures to approving commercial reception. 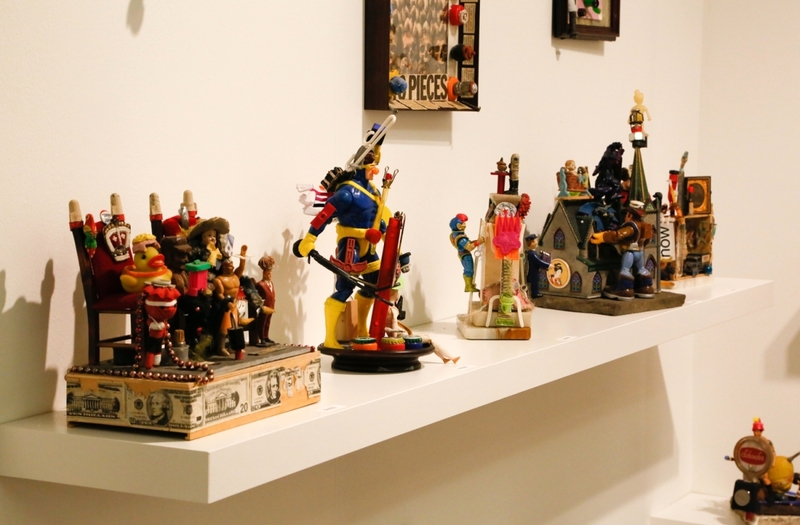 The bulk of the artist’s series is currently in “Parenting: An Art Without A Manual,” an exhibition at the American Visionary Art Museum in Baltimore, on through September. Brooklyn dealer Steven S. Powers described the show’s enthusiasm, saying, “There is real energy on the floor. The audience is interested and engaged and not intimidated to learn converse or offer opinions. There is never any down time from opening until close.” Powers’ sales included an important collection of 11 Kansas State Insane Asylum drawings, dating from 1892, and a photographic sheet of stamps that sold to The Morgan Library. At the center of the dealer’s exhibition were monotype prints from Czechoslovakian artist Miroslav Tichý, who is better-known for his photography. Tichý’s work focused on the female form. “He made cameras out of tape, cardboard and tin,” Powers said. “No one took him seriously, they didn’t think the cameras worked. It was discovered later that he had piles of photos. All unique prints.” A former neighbor of his, Roman Buxbaum, convinced Tichý to exhibit his work. His first show was in 2004, with many following afterward. In 2009, following the artist’s favorable reception into the art world, Tichý accused Buxbaum of exploiting his works without authorization. The artist passed away in 2011. Los Angeles-based artist William A. Hall’s scenes of retrofuturistic automobiles on precarious journeys were worth a look in the booth of Surrey, UK, Henry Boxer Gallery. The artist’s pencil and crayon works incorporate cars, some of them long and sleek – picture a 1920s Rolls Royce Phantom with a George Jetson style glass dome atop the cab – onto roads that always seem to instill doubt and uncertainty as they wind through overgrown grottos with tangled root systems or along cliffsides. Looking further into the cars, one finds that Hall’s work is focused on safety. His extended prototype bumper systems protect pedestrians from impact. His plexiglass domes offer full-circle vision. Hall began this body of work from the driver’s seat of his car, which he lived in for ten years of a two decade homeless stint on the streets of Los Angeles. He has since put a roof over his head. 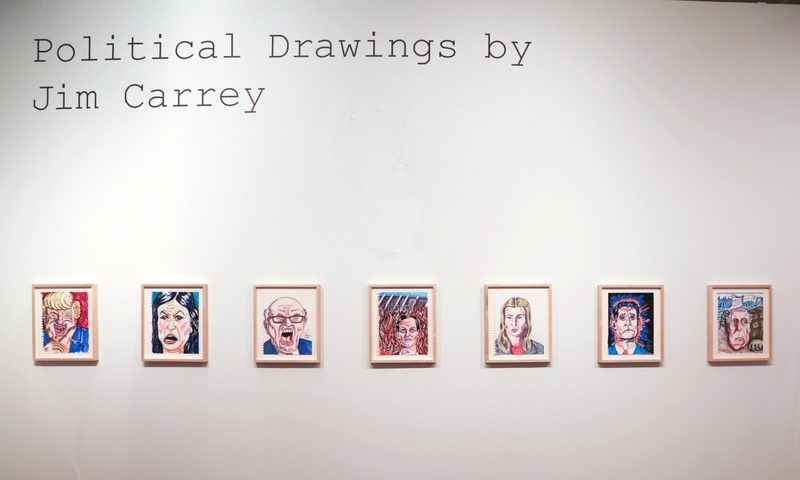 It was probably a stretch to call Jim Carrey an outsider artist, with every single one of the actor’s political cartoons, exhibited by Los Angeles gallery Maccarone, landing squarely within our broadly shared reality. Nonetheless, Carrey’s contorted and puckered caricatures of the Trump Administration – from the entire Trump family to Sarah Sanders and Mitch McConnell – were provocative and, of course, funny. The gallery provided the following: “Carrey’s cartoon drawings are a conduit for his frustration and disappointment in the US constituency… a tragic humor imbues these political cartoons.” There is always room for a joker in any crowd. 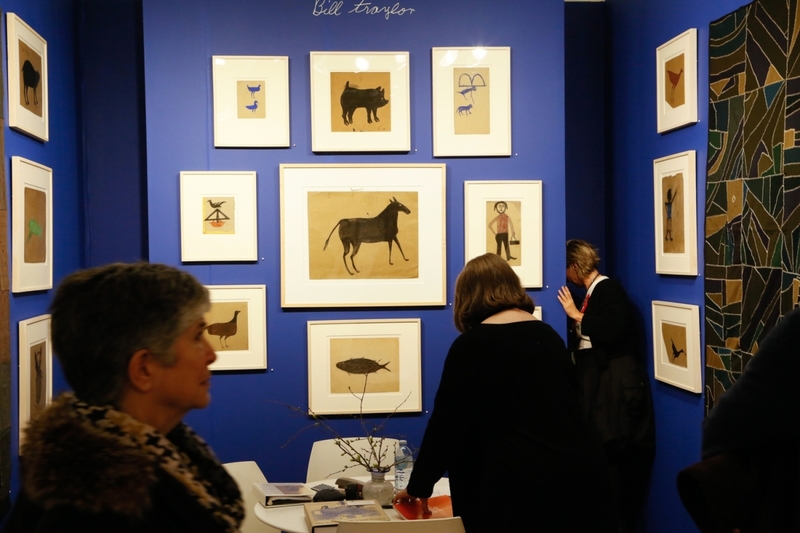 Legendary outsider artist Bill Traylor was replete throughout the show floor. 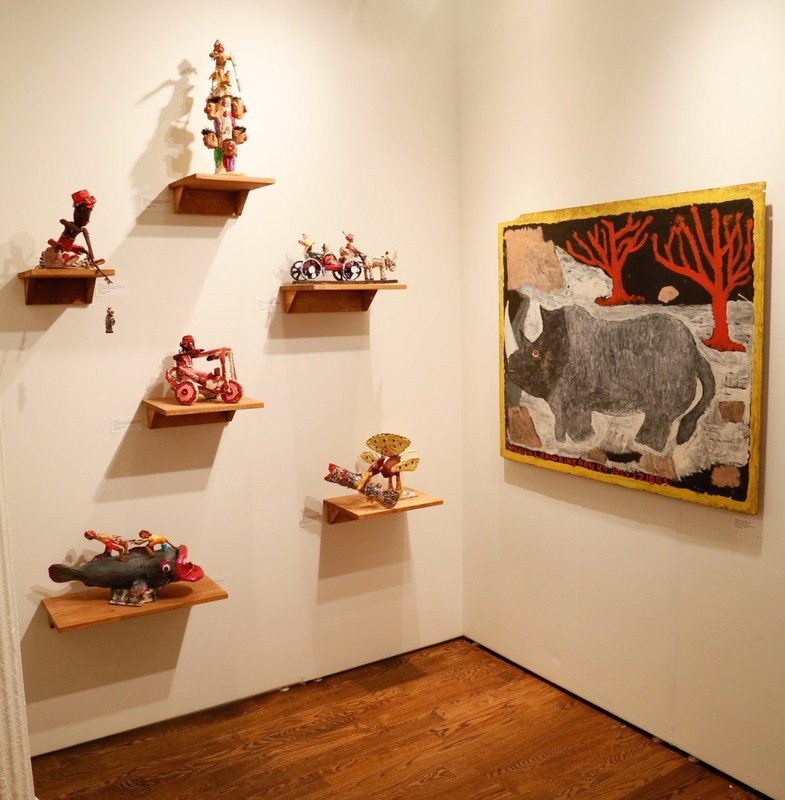 Notable here was a solo show at Just Folk, Los Angeles, which held more than 20 Traylor works focused on single subjects, including animals from pigs, fish and horses to the human form in both standing and pointing figures. 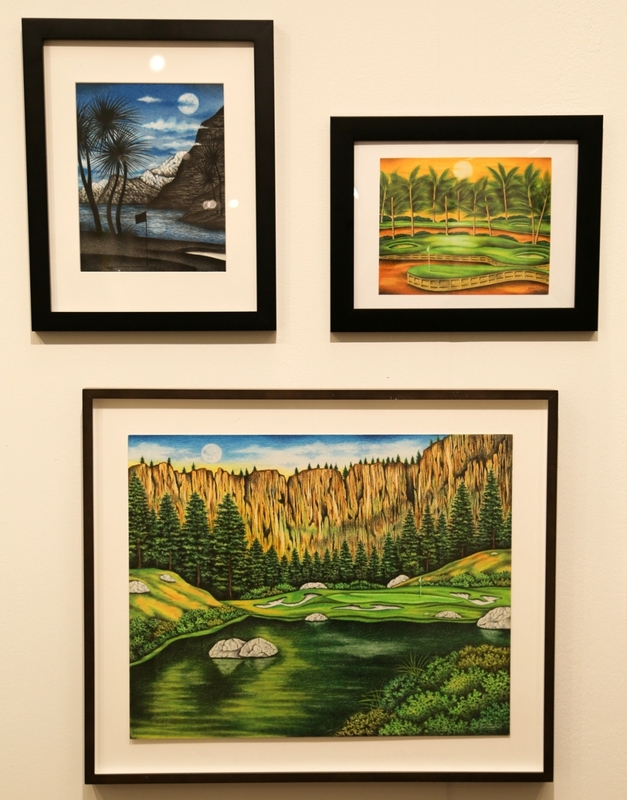 Wearing his gallerist hat, Andrew Edlin showed off the fluid colored pencil on paper golfscapes of Valentino Dixon. Dixon caught headlines in September 2018, when he was exonerated after 27 years in prison for a murder he did not commit. His exoneration can be credited to the art he produced – the idealistic golf scenes with bright sunsets, manicured greens and perfect weather. Knowing he had talent as an artist, Attica Correctional Facility warden James Conway brought in a photograph of Augusta National’s 12th hole for the inmate to draw as a favor. He began to draw more golf scenes, taking pages from another inmate who subscribed to Golf Digest. 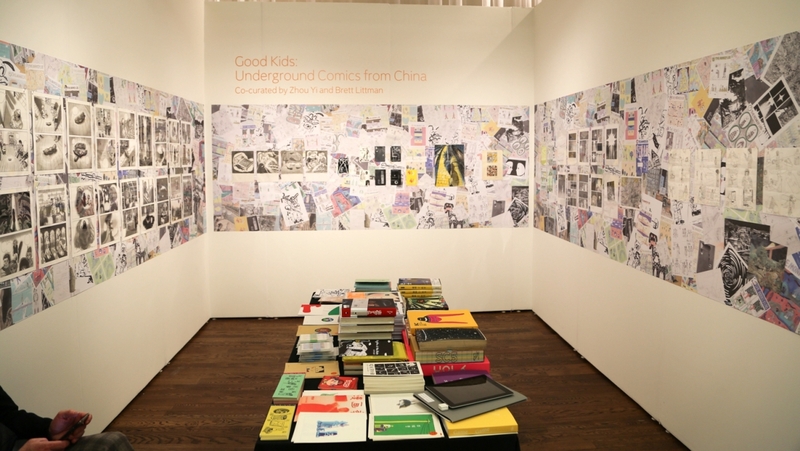 The artist’s work caught the attention of the same magazine in 2012, and the story it subsequently produced brought much-needed visibility to Dixon’s case. His case was taken up by a team of lawyers who were then able to submit new evidence and get a confession from the actual perpetrator, who was serving a sentence for an unrelated murder. Dixon was freed the following day. The artist told Golf Digest, “After 19 years in Attica Correctional Facility, the look of a golf hole spoke to me. It seemed peaceful. I imagine playing it would be a lot like fishing.” Shown on Edlin’s walls were three Dixon works, and all of them made one dream of a better, warmer place. 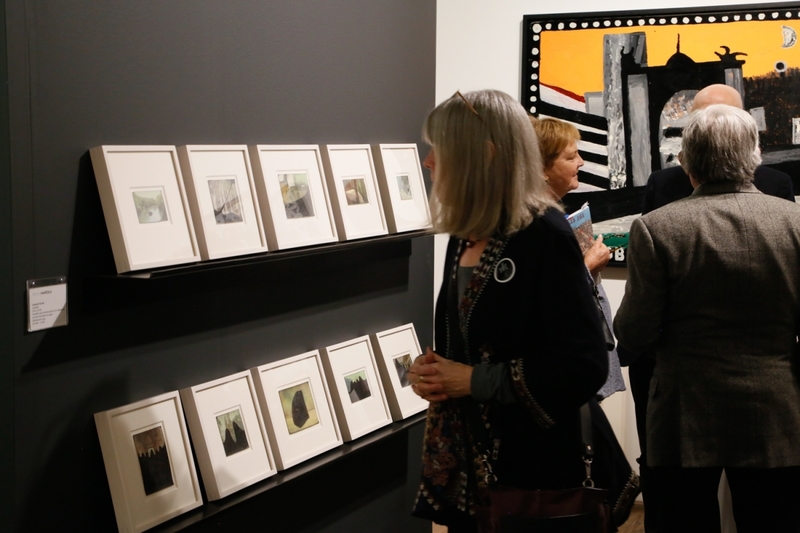 The Outsider Art Fair’s next stop is Paris, October 17-20. It will return to New York City in January of 2020. 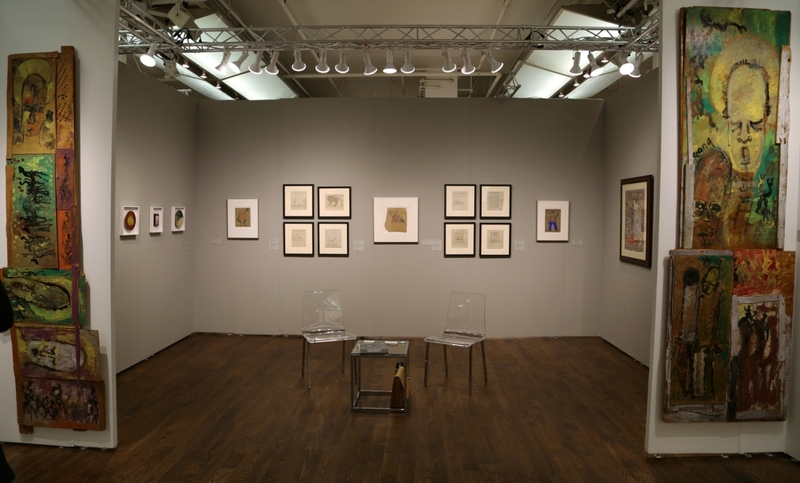 For more information, www.outsiderartfair.com or 212-337-3338. 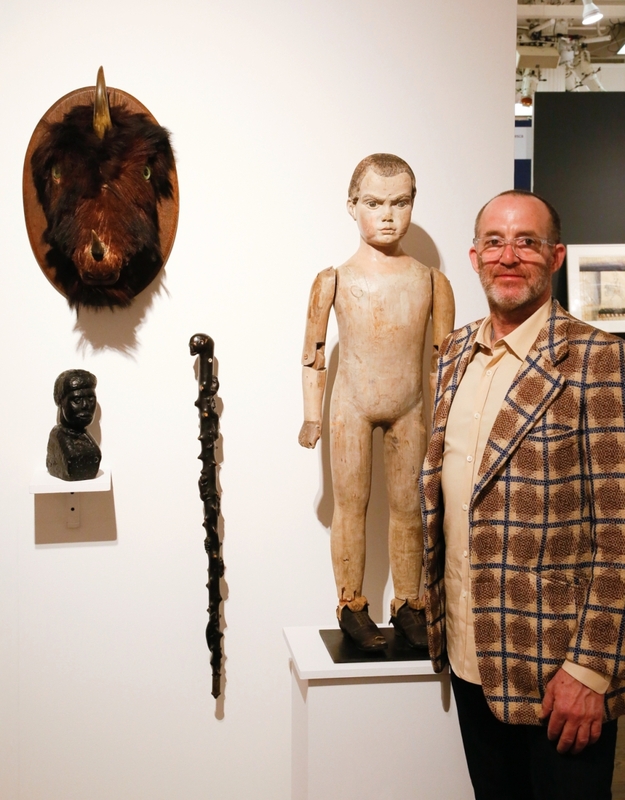 Steven S. Powers, Brooklyn, stands before his exhibition titled “Finding North” at the 2019 Outsider Art Fair. To the left and behind him are monotype prints from Czechoslovakian artist Miroslav Tichý. Tichý’s work in photography and printmaking focused on the female form.